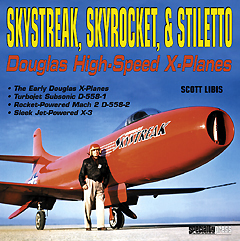 Continuing their series of excellent photojournals devoted to aerospace subjects, Specialty Press have published Scott Libis' Skystreak, Skyrocket, & Stiletto: Douglas High Speed X-Planes. The late 1940's and early 1950's were a time of rapid advance in all areas of technology. Science and technological progress became part of popular culture, and science fiction had it's first Golden Age. People were confidently looking forward to a limitless future - with flying cars, mechanical servants, the whole shebang. On the frontier of scientic advancement were the test pilots and the research aircraft they piloted. Jet (gas turbine) and rocket propulsion were making great strides, and the mysteries of the sound barrier beckoned. Douglas Aircraft launched 'X-Plane' projects to explore the effects of high speed flight: the turbojt-powered D-558-1 'Skystreak', which explored transonic flight; rocket-powered D-558-2 'Skyrocket', which became the first US swept-wing aircraft and the first to reach Mach 2; and the X-3 'Stilletto', which was used to explore the effects of small wings with a large fuselage and was later, intertial coupling. The book is divided into three chapters, one for each program. Like the rest of Specialty Press' books on X-craft, this one has a complete development history of each aircraft, documenting important flights and interesting experiences. Special attention is paid to the test pilots as well as the technology that was developed during the course of each project. Three appendicies contain complete flight history for all three programs while a fourth provides a short history of Muroc Dry Lake (now Edwards AFB), where the testing was accomplished. The book is lavishly illustrated with 275 photos, including many in color, plus diagrams, plans and drawings. Mr. Libis' text is clear and easy to follow, without the occaisional typographical and editorial goofs present in early volumes. As a general reference, it's a great book, and makes for some fascinating reading. Modelers will find the information on colors, markings, and variations between airframes and over a particular program's duration very useful. In most cases, though, you'll need to hunt up further documentation for things like cockpit layouts. This page copyright © 2005 Starship Modeler. First posted on 17 June 2005.